It seems of all the wireless standards, 802.11n is having the longest digestion period. First put forward for ratification in 2003, we're still yet to see a final release. With this in mind, most manufacturers have launched 'pre-n' devices, which meet the current paper and, at best, will need a firmware upgrade and, at worst, won't work at all with similar devices, whatever ratification happens. If you're only buying for your home, this won't be a problem, but businesses looking to expand won't really want to buy into the unproven technology. The Buffalo AirStation Nfiniti draft-N router is part of the growing pre-n release cycle. The obvious reason for its release is the greater speed 802.11n can offer, which is a theoretical 270Mbps, compared to the 54Mbps of 802.11g. As we're all aware, this isn't a real-world speed, as you're likely to get around 80-90Mbps from the device, dependent on connection strength. We set it up in the home and found a connection of just over 55Mbps when running between rooms separated by a single wall. This kind of speed suddenly opens the options for Wi-Fi about the home. Powered by the Broadcom Intensi-Fi chipset, which has been developed for the intensive demands of video streaming and fitted with a MiMo (Multiple in, Multiple out) three-antenna configuration, you'll get a consistent throughput. As with other products in the line, you'll find Buffalo's Aoss (AirStation One-touch Security System) included, which allows for trouble-free set-up of devices. 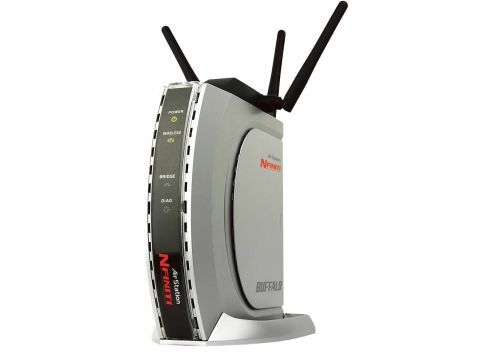 Obviously, to make the base station work you'll also need Nfi niti 802.11n in your laptop. At the moment, you'll only find PC Cards supporting the technology, but Buffalo assure us a USB version will be out in the coming months. If you want faster performance and aren't worried about changes in the clarification of the 802.11n standard, this is the router for you.